Spelling You See or All About Spelling? Spelling You See (SUS) and All About Spelling (AAS) are 2 popular spelling curriculums many homeschool families use, have used, or are considering using. Since we used 3 different levels of both SUS & AAS, I will review both by describing, comparing, and explaining, our own experience and results while using these curriculums. Simply put, Spelling You See (SUS) relies on the use of the student’s visual memory to recall how a word is spelled, where All About Spelling (AAS) teaches students spelling rules to help them remember how to spell words. There is much more to both of these curriculums, so let’s now take a deeper look at each one. There is some confusion about Spelling You See being a Demme Learning Product. Altho it is sold by Demme Learning and it shares part of its name with Math You See, SUS is not taught or developed by Mr. Demme. A little background about the author of SUS, Dr. Karen Holinga. Spelling You See was developed by Dr. Karen Holinga who is a Reading Specialist with a Doctorate in Developmental Reading, Curriculum, and Professional Development. 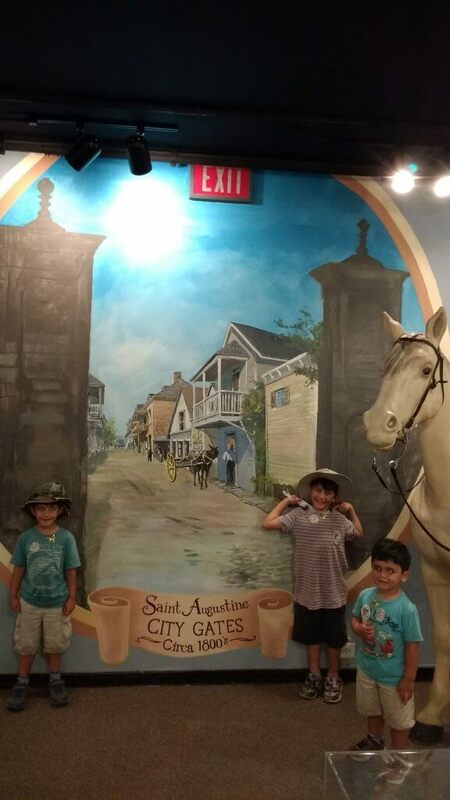 Dr. Holinga has deep ties with the homeschool community as she has homeschooled her own 3 children, and has been working closely for many years with Homeschooling families. For many years and still till this day, Dr. Holinga tutors homeschooling children with reading disabilities at her Ohio clinic. If you’ll like to know more about her and her work you can click on The Reading Doctor, Inc link which will take you directly to Dr. Holinga’s business website. One of the reasons Spelling You See works for many kids has to do with this program not using any weekly spelling list for kids to memorize.🙌 For most of its levels (with the exception of Level A and the first part of Lev B), the focus of SUS is for the students to rely on their photographic memory to recall how to spell words. How? By having them complete copywork during most part of the week and then moving on to Dictation as the last step of each lesson. Dictation at the end of each week is to help solidify what students have been reading and copying throughout each lesson without the stress of administering spelling tests. Each level of Spelling You See has 36 lessons and each lesson is meant to be completed in the span of 1 school week (5 days). 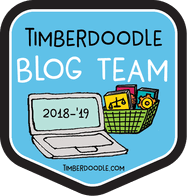 Each week/lesson introduces a new passage (riddle, poem, historical facts, etc. ), and the content will vary depending on grade level. **Please note** Level A, half of B, and Level G do not follow the 5 steps below. A lesson of SUS consists of 5 worksheets. Students complete 1 worksheet x day and the lesson takes no longer than 15-20 min. Repetition is key in Spelling You See and to complete each worksheet students follow 5 Easy Steps on a daily basis. Below is a breakdown of a SUS student’s daily routine and how each Step is meant to help a student painlessly learn how to spell. Step 1: Reading. Every day the parent reads the passage of the weekly lesson to the student. Immediately after the student reads the same passage back to the parent. In many Spelling you see webinars, the host stresses the importance of beginning each day with the teacher reading the passage to the student. Why? They explain how kids (especially boys), at times might change a word or more to something that is easier for them to pronounce or remember (boys can be lazy, I have 3 of them and can absolutely attest to that😊). By having us parents first read the passage while pointing to each word as we do, we are training our child’s eyes to correctly visualize all words to the sound they hear. This 1st step might seem unnecessary to many but is instead fundamental in being able to tap into a child’s “photographic memory” (Visual-Memory skills) and consequently spell these words correctly. Simply, by skipping or changing words while reading, kids aren’t visualizing them, resulting in not being able to spell the words correctly. Step 2: Chunking. Every day the student is to find and color what SUS calls “letter combination” or just simply chunks. There are 6 different types of chunks and each is color-coded. Every day after the student reads the passage they have to find a specific number of letter combinations and color them in their correspondent color. 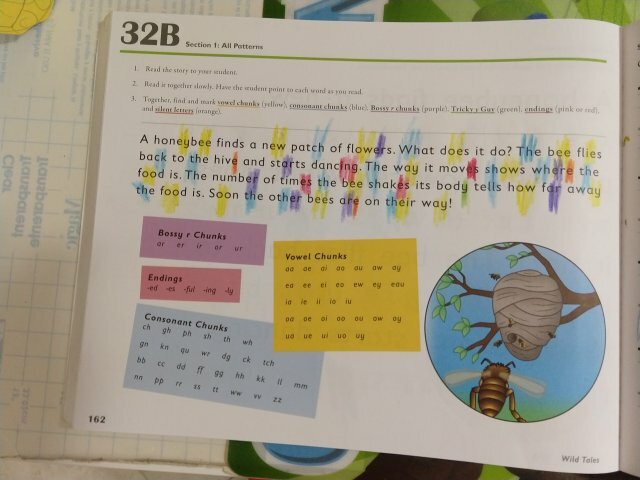 A list of all Chunks is provided in the Teacher’s Manual together with all the color-coded answer key for each daily worksheet. Consonant chunk /CH/ will be color-coded Blue. Bossy R chunk /ER/ Purple. Tricky Y guy /Y/ Green. Any Silent Letters in Orange (an example “would” has a silent /L/). Endings /-ING/ in Pink or Red. “Chunking” Lesson 32B, Level C.
The reason behind this daily process of chunking is to help the student associate phonetically irregular sounds within words. In other words, is meant to help the student visualize these words so in the future they can tap into their photographic memory and correctly spell them. Step 3: Copywork. Each lesson will require copywork from day 1-3. On those days the student is required to copy the passage in print on the next page. “Copy Work” Lesson 32B, Level C.
After reading and chunking the passage the student can now move on to the next page to copy part of the passage. There are 3 very important things parents must keep in mind during copywork. Do not use this copywork assignment as penmanship time. Copywork should not be done in cursive. Kids should only do copywork for 10 minutes whether they finish it or not. I always made it a point to praise my child once the timer would ring, and if he hadn’t finished I would tell him he did more I expected him to do. Why? Because the timer is set to don’t allow our children to be burnt out not to make it into a race. This also helped me keep our spelling lesson short and sweet. Did you know SUS copywork shouldn’t be used as handwriting practice time? I didn’t until I listened to one of their webinars and it all made sense! If children start worrying about their handwriting form it takes away from their focus on copying each word. Remember the goal of repetitive copywork is to help kids visualize those words so they can then remember them when in need to spell them. SUS advice is to refrain from correcting any handwriting sloppiness. SUS Copywork should be done in print, no cursive allowed. Why? It’s been explained during their webinars how the brain is not able to store long-term cursive text. For us, this wasn’t an issue since our kids started learning cursive later on for many families this might not make sense. If you’ll like to read more about why cursive isn’t allowed during Spelling you see copywork and dictation you can click here to read Demme Learnings blog about Cursive in SUS. Step 4: No Rule Day or Dictation (Depending on the level). In Book #2 of Level B and all of Level C, this day requires the student to solely focus on free writing and their spelling shall not be corrected. From level D-G, day 4 is a relaxed dictation day where students are allowed to ask for help if needed. Example of No Rule Day Assignment, Level C.
Our kids looked forward to No Rule Day, it was their favorite part of the program! Kids this day are free to use their imagination to write or draw as little or as much as they want! The best part of it all, their spelling doesn’t get corrected, Horray!! Yes, SUS advises parents from refraining on correcting any spelling errors on No Rule Day to encourage and help kids develop a love for creative writing. Step 5: Dictation. On day 5 the weekly lesson will be completed with a dictation assignment. The teacher will dictate the passage the student has read, chunked, and copied throughout the week. And last day of the week wraps up each SUS lesson with Dictation! Please know dictation with SUS isn’t as scary and stressful as we know dictation can be. Their approach to it changed the way I’ll dictate anything. Just as per Copywork and No Rule Day, on Dictation day a 10-minute timer is set and whether kids finish or not they will stop when the timer rings. I always made sure to tell my child how the timer was on not to put pressure on him or rush him. Telling your kids the timer is their friend and is actually on so us parents don’t make them work too long and burn them out, makes a huge difference. **Please note** From Level D on, dictation will take place of No Rule Day and will be done for 2 days in a row. The first dictation assignment is more relaxed where students are allowed to ask for help (almost like a mock trial😉). Spelling You See, Level B, worksheet example. 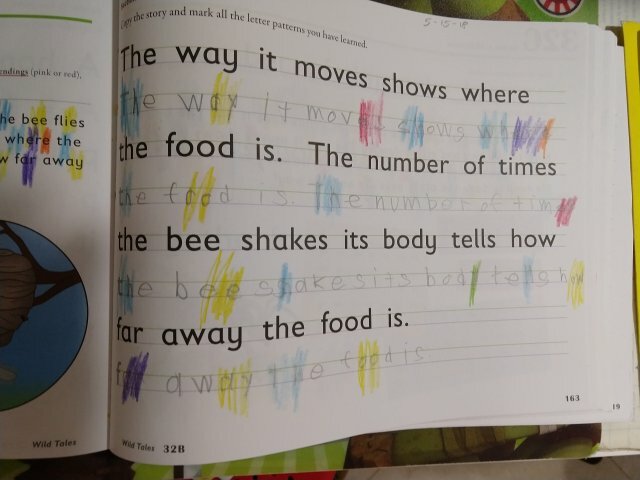 These levels have (at times) very little copywork right below the passage, then on the next page, there are empty boxes for young students to write in words from dictation. The boxes are a genius idea, as it helps children segment the word in their mind without even realizing it. Level A follows this structure throughout both workbooks books, where level B moves on to the structure I have explained on my review above in workbook #2. During these combined levels, students will spell 3, 4, and 5 letter words. In Level G (last level), students won’t be “chunking” letter combinations within words but instead focusing on recognizing base words, prefixes and suffixes. Copywork and Dictation assignments are still part of these levels. Teacher’s Manual (Necessary). This is a very clear and user-friendly Step by Step lesson guide for the instructor to follow when teaching this program. The number of lessons for each level varies from 24-30 (for example Lev1 has 24 lessons, where Lev3 has 28). Student Packet (Necessary). This packet includes visual components (Flashcards, Charts, and different Visual teaching/learning aids) needed to help the student learn, practice and review the AAS rules introduced throughout the lessons. Interactive Kits (2 options). 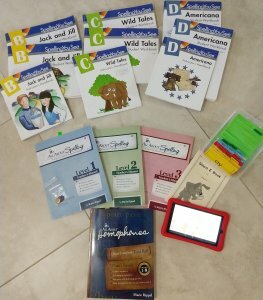 1st Option: There are 2 versions of this kit (Basic or Deluxe) both of these kits include (Magnetic Tiles, Divider Cards and Phonogram Sound App). In addition, the Deluxe version includes Divider Cards Box and Tote. (Magnetic whiteboards are not sold thru AAS and will need to be purchased separately). 2nd Option: AAS Tiles app ($20) plus the purchase of just the Divider Cards. This is a fairly newer option for those who prefer not to have the Physical tiles but use them thru the AAS app instead. The Divider Cards are still necessary and need to be purchased separately (about $5.00). Some families choose to buy the interactive kit AND the Tiles app for extra practice on the go. **Please note** you will also need a box to keep the flashcards and card dividers. AAS sells their own for about $12. We saved some money and bought a Rubbermaid storage box at the Dollar store. All About Spelling Tiles App. A look into All About Spelling’s weekly routine. At difference than Spelling you See, All About Spelling‘s weekdays can look very different from one another. The reason for it is because this program is very customizable to different learning styles and also very flexible if the need arises to adjust your weekly schedule due to any life events. Also, keep in mind lessons within each level can vary in difficulty, where a lesson could be completed in a day (or maybe even 2), but the next lesson might require 3 days to complete. I found this flexibility actually took the pressure off of me and helped me not feel we were falling behind if for any reasons we couldn’t get to spelling on any given school day. Learning Styles: AAS being a multisensory program is easily adjustable to different learning styles and for kids who face different learning challenges. My eldest child, for example, can be easily bored and annoyed using manipulatives even if his learning style really benefits from using those. Thanks to the All About Spelling Tiles app we were able to incorporate the use of virtual manipulatives taking the frustration out of using tactile ones. Although many students will benefit from physically touching the magnetic tiles, my son would have gotten frustrated by all the organizing and reorganizing these tiles require within each lesson. Knowing my child, we purchased the AAS Tiles app instead and it has been an absolute blessing. BRAVO to whoever designed this app because it is magnificent! When using the app you pick the level and lesson you are working on and automatically all tiles needed for that lesson appear. 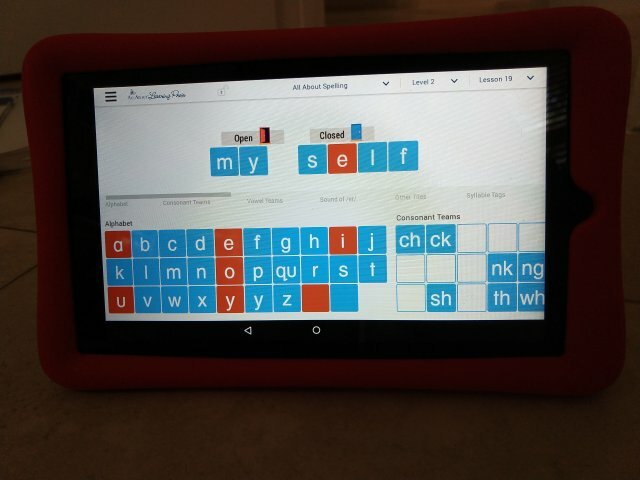 After building a word, with just the swipe of a finger tiles go back into their assigned spot and the student is ready to build the next spelling word! This app has made our spelling lessons quick, easy and frustration-free, with an extra perk of not having to buy and store a magnetic board that would be needed if using the magnetic tiles. Although our family doesn’t have the challenge of working with Dyslexia and/or Dysgraphia, many homeschooling families do and I’ve included links to each All About Spelling’s own Blog Post about how to successfully teach this program when facing these learning challenges. I did not find any specific blog post about using AAS with children with ADHD, however many families do use AAS with ADHD children and I’ve included a link to AAS’ Facebook Support Group. Here many parents and AAS staff members answer all questions with tips and advice on how to adapt this program to successfully overcome obstacles children with ADHD face or other learning challenges. Before moving on to using AAS in 3rd grade, my eldest child was completely lost on how to spell all phonetically irregular words. The memorization of weekly spelling list we used in 1st-grade didn’t work for him, and neither did copywork by repetition we used the year after. A few months into 3rd grade, I realized when spelling words he was guessing and this process was very exhausting and frustrating for him. My son actually has a very creative mind and truly enjoys creative writing but his spelling troubles were preventing him from truly exploring and enjoy the process. AAS teaches the rules of spelling by using “unique little tricks” that truly makes learning spelling a breeze, without relying solely on memorization. I cannot possibly list all tricks and rules that in our opinion makes AAS a standout spelling program from all the rest but here are a few highlights to give you an idea. Segmenting.🙌 Oh, how this changed my teaching life and my kids’ spelling! In level 1 AAS student pack provides 5 colored tokens to use along segmenting lessons and beyond, and you’ll be amazed how quickly these made segmenting stick. Between the novelty factor, the bright colors, and how the process of segmenting words brought success to their spelling, both my children were intrigued and loved doing this exercise. My 3rd & 1st grader after mastering this concept, quickly transitioned to visualize this process in their mind and it’s been another game changer in spelling many words. No English words end with i. This simple but yet important AAS rule took the guessing out of spelling words that end with the long sound i. My son after learning this simple rule, when he hears long i at the end of a word he automatically spells it using an ending y. 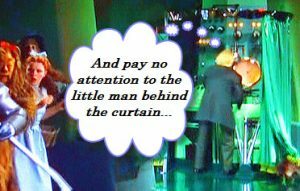 Sure he had learned this rule thru his phonics program while learning how to read, but the rule he learned was too wordy for him to remember. AAS makes every rule Short, Simple and to the Point, and that’s why these rule actually stick! Syllables. This had been a crutch to understand until AAS came into our life. I cannot stress enough the importance of truly understanding syllables in order to be a good speller. I’m completely amazed at how easy AAS makes learning all different types of syllables and how to correctly dived them. After learning when syllables are considered “open”, “closed”, and “vowel consonant-E”, they then introduce their 3 “Syllable Division Rules”. Not only the rules they teach are broken down into simple and easy steps to remember, but also AAS teaching sequence is impeccable! Silent E Book. Each level of AAS provides different teaching/learning tools and in level 3 the “Silent E Book” is provided. Once again AAS allows kids to master all silent E jobs with little no fuss. 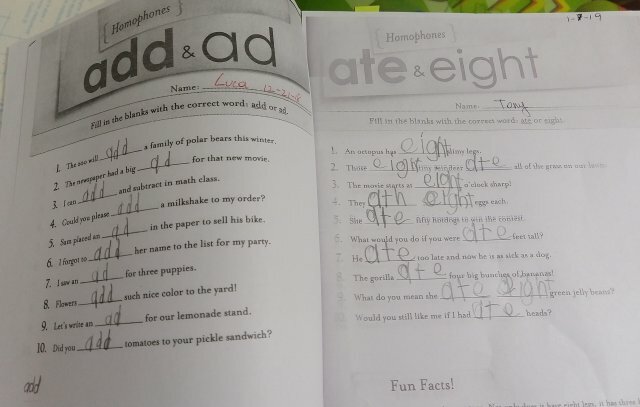 On each part of this booklet, kids list 13 words that follow one of the 5 AAS silent E jobs (example how silent E make the vowel before long, or how silent E makes c and g soft, etc..). It doesn’t get any easier than this. Homophones. Not only AAS does an excellent job teaching children homophones beginning in level 3, but it also sells an “All About Homophones” book. This book is a separate purchase from the All About Spelling curriculum but it is a one time purchase that will last from level 1-8. Just like in AAS, you can progress as fast or as slowly as your child needs you to, doing 1 worksheet a week or one worksheet a day. No matter how you chose to tackle this book I can assure you it is well worth the $18, adding learning and fun completely free of any frustration. 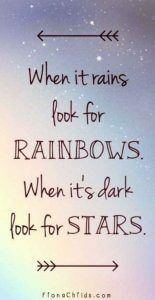 Worksheets are simple but powerful and our children look forward to completing them each day I assign them one. All About Homophones, worksheet assignment. (Notice how my 6yr old asked if we would still like him if he had “ate” heads? 🤣) Another reason we love “All About Homophone”!! In my opinion, the main difference between these 2 spelling curriculums is their approach to help kids memorizing. 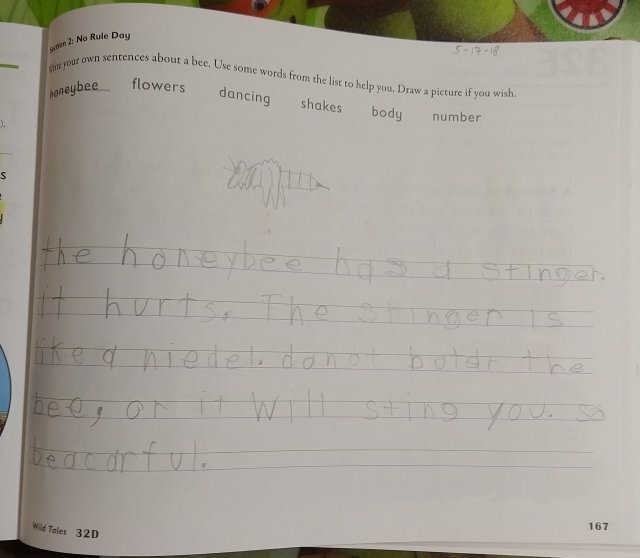 Spelling You See (SUS) relies on copywork and chunking to help kids visualize and subsequently memorize how to spell the words presented in each passage. All About Spelling (AAS) teaches and relies on students remembering easy and simple spelling rules so children can tap into them and one day be able to spell all English words. Another major difference I personally found between SUS and AAS is scheduling. SUS relies on a fixed 5 days a week schedule, where if you skip a day would mean skipping a worksheet and the next day moving on to the next to stay on schedule. AAS is a much more flexible program where you can more easily adapt it if you do not wish to do spelling 5 days a week. As I mentioned at the beginning of this post, we have used the 3 beginning levels for both of these programs. Although my eldest child loved the simplicity and the science behind Spelling You See, truth is, it wasn’t a good fit for his learning style. On the other hand, my 6 years old truly enjoyed and thrived using Spelling You See lev B part 1. I was so impressed and pleased with the layout and structure of this level I am considering using Level A and part 1 of level B with my youngest child as well before transitioning to “All About Spelling 1” in mid 1st grade. Some homeschoolers who use SUS complain about the amount of copywork, however, that was absolutely not an issue for my son. Although “chunking” did become pretty intensive towards the end of Level C and throughout level D, my child had no problem handling it. He loved how the timer made him see the end of his work and he loved how there wasn’t a test to pass at the end of each weekly lesson. So what was the problem? He struggled to remember how to spell the words by just relying on his visual memory. It just wasn’t for him, he needs more. My child learns at his best when combining visual, auditory and hands-on skills. Now if I had known of Spelling You See when I first moved to the U.S. 15 years ago, it would have been a home run for me! I have a photographic memory and SUS would have made my spelling learning much easier. At the end of it all, SUS not working for my eldest child isn’t to say the program doesn’t work, it was just a poor matching on my end as I hadn’t discovered yet my child’s learning style. Figuring out the reason behind my child’s poor spelling was the first step towards success and since then “All About Spelling” has been a complete game changer for us. May this post equip you with the knowledge needed to pick the right spelling curriculum for your family. I was not familiar with SUS, but we have used AAS for a few years now (my eldest, 9, is halfway through part 3), and it has been very successful. 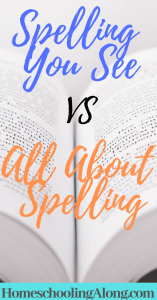 Writing is a major roadblock for us, and I am able to customize our spelling lessons into easily digestible its for him that we tackle twice a week. The first lesson is oral, and then we use tiles to analyze the words. The second lesson I dictate the words and sentences I want him to write to practice that particular lesson. 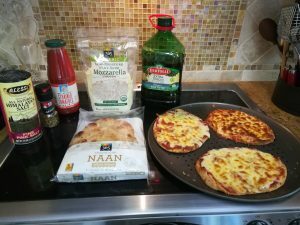 It is just enough for him to learn and progress without getting frustrated or overwhelmed. We are moving slowly, but he is becoming a proficient speller, and *I* am learning spelling rules I never knew before! I love hearing success stories! Whenever we find a curriculum that works it feels so good, doesn’t it? I think your story is a great testament to how easy it is to adjust AAS to many different learning styles or learning struggles and still work its magic. For us, switching to AAS was a wonderful change. My child needed the rule structure to keep the guessing out of spelling, and I’ve also noticed the rules help in decoding while reading as well. Thank you for reading and sharing your story, Bria!